The Decor Enthusiast Style Team has a surprise for you today! We have each picked a popular decor item that we love and knew that you would as well! Why do you ask……we are each giving the item away on our blogs. That's 6 home decor prizes to 6 winners! I really want one of each! We've got you covered from getting cozy this winter to entertaining and organizing! I am giving away this set of 3 graduated galvanized cake stands and the pretty kitchen towel all from World Market! I love these because they are graduated in size and can be used independently of each other. Cake stands are not just for cakes folks! I fell in love with the towel. The colors are so pretty for fall. This cake stand used here is perfect for displaying plates for a buffet by Confessions of a Serial Do-It-Yourselfer. Look for unusual cake stands like this one for food and more! 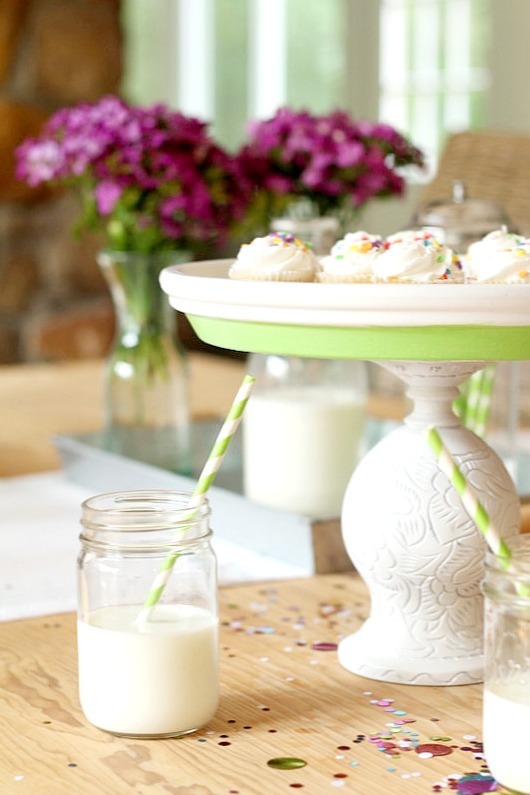 You can even make cake stands to display cakes and as a drink dispenser from Refresh Restyle. 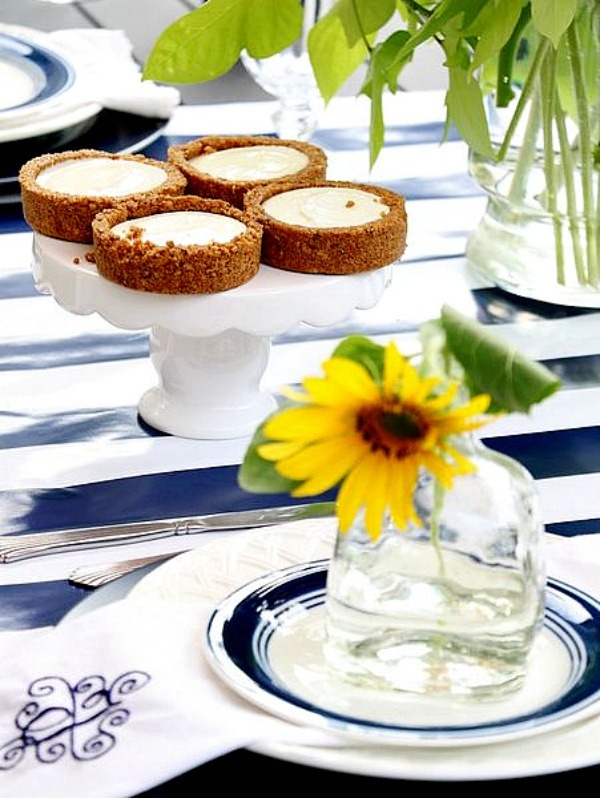 Use cake stands to display food on your dining table. So pretty and functional by Duke Manor Farm. The only thing that you have to do to enter my giveaway for the set of 3 cake stands and gorgeous towel from World Market is to share below in the comments how you would use the cake stands. You can earn option entry points by visiting my Facebook page, but not required. Be sure to visit the other ladies below to enter to win the other prizes. You can enter to win all the prizes! This is only open to residents of the US due to shipping. Good luck! HINT: If you are mobile, you may have to click on the upper left tab and select to view desktop site. The entry widget may not show on your device unless you do that. It's time to click on the links below to enter to win the other prizes. Good luck! Debbie from Refresh Restyle is giving away this gorgeous 3 tiered stand! I have a few of these and they are so versatile. Shanna from Restoration Redoux is giving away this gorgeous embossed tray! Christy from Confessions of a Serial Do-It-Yourselfer is giving away this gorgeous faux zebra throw! Sign up for email updates – usually 1-2 per week with new ideas delivered to you inbox! Its FREE! small finger sandwiches. Oh the possibilities! I would enjoy using the tiered stand for serving desserts at church dinners and doing seasonal displays. Thanks for the opportunity to win! These are so pretty! I would use them for entertaining around the holidays, and to dress up my open shelving in the kitchen the rest of the year. I love cake stands, they are so handy and diverse,i will use them for decorating in my kitchen/dinning room.thank you so much!!!!!!!!!!!!!!!!!!! It would be great for displaying desserts! I love this stand! I would use it for baked goods that I have often in the house and the k-cups idea is great also! This cake stand is so cute! I would love to use this for a coffee station and holiday decor piece. By mixing fun collection of holiday decor, K-cups and some sweet treats I think it would be super cute and functional! I would use them to hold fruit. I think it would be an “outside of the box” decorative touch and I change from the fruit bowl/basket. The lovely towel might find a place draped on the edge at some point. What an amazing giveaway! Thank you and best of luck to all. I could use it to serve desserts or fresh bread, cheese and crackers. Oh so many things!!! What about with the stuff for cocoa?!!?! I would have it in my kitchen with fruit on it initially. This is so neat. Thanks for this opportunity. I would use the cake stands in my craft room or on my dresser for jewelry. That cute towel matches the colors in my kitchen perfectly! My bathroom is all stuff from World Market. I love cake stands because of the versatility. Craft room fo r staorage, dining room for display, so hard to choose. I would use the trays to display mini white pumpkins, coffee mugs, seasonally flavored teas, coffee & small vase/fresh flowers. I think it would be great to hold some of the counter clutter in the kitchen, keys and pens, etc. and still be decorative, with a plant or some fresh lemons. Very cute! Very pretty pieces. I like being able to use items I can move around for seasons or gatherings. I would use them to style my shelves. A bit boring now with all the white. I would use them for desserts or appetizers on Thanksgiving. I host Thanksgiving every year and would love to use that for display. Love your ideas for cake stands. I like the rustic look of these, and would use them to display candles and seasonal items. I would use it in my craft room to organize craft materials and at Christmas to hold decorations. I would use the tiered cake stand for seasonal displays or as desktop or vanity storage and display. I have a whole bunch of mini pumpkins and gourds that would look great on my eat-in kitchen table. Soooo excited to win, lol! I love anything galvanized and have a collection started. This would be a awesome piece to be added. This stand would be cute for serving appetizers or goodies for parties. So cute, I love the sides. Would display Fall & Halloween seasonal items! I would love these cake stands – I could use them all over the house! So many beautiful cake stands and love the way you use them so beautifully!! I love all kinds of stands too… Everything on a stand! Love the galvanized steel, I’d use them in my Christmas decorating! These would look great on my dining room table with mini pumpkins and gourds in it. I would use the stands for Holiday entertaining. I would use it in my bathroom with my collection of decorative soaps in their unusual boxes (like “Wash Away Your Sins” soap for example)!! I would use them to display goodies for Christmas! But, they could be used for every holiday! So many great uses for these – thanks for the opportunity! Those cake stands are adorable. They are just what I need to add a little farmhouse vibe to my home. I’d use them first on Halloween to put all the treats on in the center of my buffet table. Then they would be great in the kitchen with fruit and fall decor.Thanks for the opportunity to win, love your posts! I think this stand would be lovely on the counter holding fruit. Love this stand! It is unique with the galvanized metal. I can think of all sorts of ways to use as a display. Right now with fall, baby boos and mini pumpkins and acorns could fill it. At Christmas, decorative balls with candles and greenery, cloved oranges. Easter, colorful eggs and bunnies. Summer, apples and mini flags. On the back porch, small potted plants. These would be great for the Christmas bake sale at our local non-profit Arboretum! The options are endless. Today I would use them to put all the toppings on for a fall chocolate fountain party. So beautiful and fun!!!! I love cake stands and multi-tiered stands! Exactly as you have yours displayed. Its adorable! I love these. I think I would use them in the kitchen for holding different snacks. Maybe candy, fruit and granola bars. I’d probably use the smallest one in the master bath and the other two stacked for fruit in the kitchen. Love it so unique!! I would use the cake pans for Christmas decorations, or even in my bedroom to hold fragrances and body lotions etc. I would group them together with Illunara Candles on each one of different heights. Put different greenery or oversize candle rings for each season around them as well. I love all of your great ideas for using cake stands. I use mine all the time to create different vignettes. I would love to use one like the one you showed at Christmas with greenery, red berries, and ornaments on the kitchen island. As my children were growing up, we foraged the woods and nature for things to display in a large wooden shallow bowl. I now have grandchildren, and as I get the opportunity to continue the same practice with them, this awesome galvanized stand would be a terrific display center for our treasures! I love your idea of using it to display K-cups. I just finished creating my coffee station with newly refinished china cabinet bottom and these would be perfect on it! i would use them for seasonal decorations. Of course now would be fall. Very cute. oow how cute I would put X-mas ornaments on it as it takes me a long time to put them all on the tree. When I’m done with that some X-mas cookies. Then use it for a B-day cel. as our family has one right after the 1st of the year. I would use this on my porch table for fall family get togethers. Just found your blog … thanks to all you wonderful ladies giving us the opportunity for a chance to win one of these great prizes. Very talented and inspirational! Cupcakes and candy of course!! Thanks for the opportunity!! 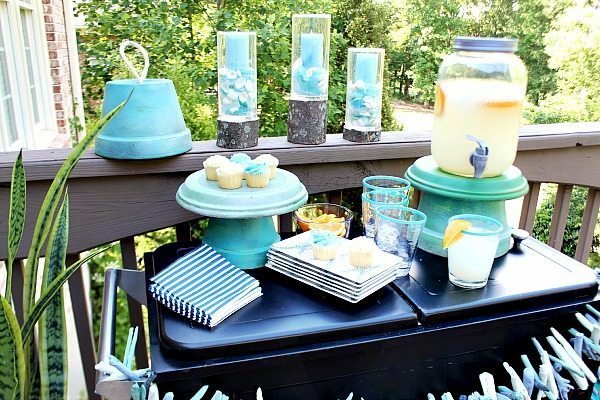 I would use the cake stand in my kitchen to set up seasonal beverage bars such as an apple cider bar for Fall, a hot chocolate bar for Winter, a lemonade bar in the Summer, etc. The tiers would hold a couple of festive mugs, ingredients for the beverages, a chalkboard sign announcing the season’s current beverage bar and finished off with a seasonal knick-knack to bring it all together! Thanks for the opportunity to enter your contest. Your home decor ideas are all so pretty! I am ready to come to your house. Sounds beautiful! Thanks so much for the kind words, Nancy! 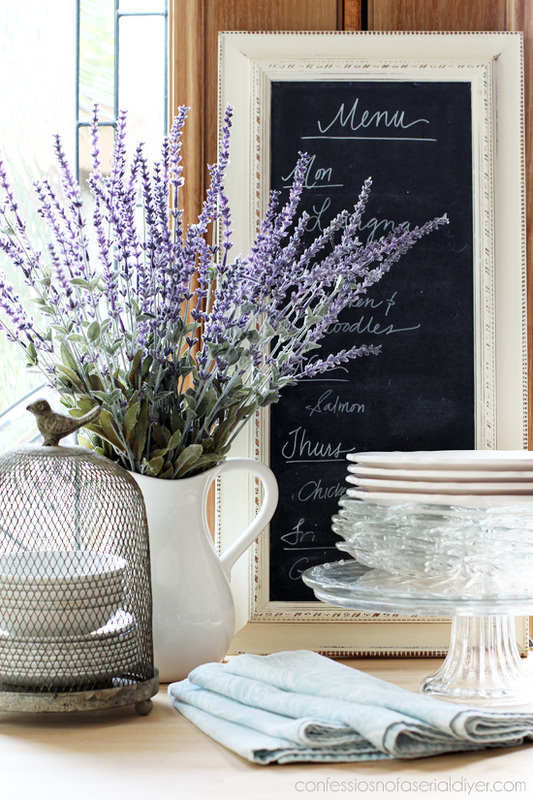 I am loving that cake stand from Southern Living. The little acorns are calling me. You always do a wonderful job accessorizing. Thanks, Cindy! Yes, I treasure that cake stand! I love cake stands and these are adorable! I would use them for all different things. I would do a fall decoration with these! Your posts really make me think about my attic stash, and what I can bring down and rearrange. I think I would display mini pumpkins, gourds, and acorns in that pretty cake stand you displayed. Thank you! Have fun hunting your attic. Happy fall! Love the cake stands! So versatile and would be wonderful for the holidays, entertaining or just displaying my small kitchen antiques. Thanks you and I love the idea for displaying your kitchen antiques! This post inspired me to think about how to incorporate cake stands into my son’s birthday party on the 22nd. We’re hosting about 16 kiddos at the local movie theater and instead of gifts, we’re accepting donations to the animal shelter. It would be cute to incorporate some photos of local shelter dogs and cats somehow and maybe some toys or stuffed animals. Maybe they can even add some of their donated items to the display when they come in! The possibilities are endless. Thanks for the post and the contest! Oh, my what a fabulous idea you have! Happy birthday to your son! Love your display. Great decorating piece. I think it would be fun to display holiday items on the cake stands! So excited for the chance to win!! I would use the cake stands to display desserts at Thanksgiving. These are so versatile for any season of the year for decorating or just in general use for holding fruit, using as a hot choc, coffee or tea station. Love them! Great ideas. Yes, they are versatile! I love pedestals!!! I use them under plants, I’ve got a big pumpkin on one right now, under candles, and even to fit more pizzas on the serving counter on pizza night. : ) Yours are beautiful! Thanks for the giveaway! Great ideas! Love for pizzas! I would use the stand to display decor mostly, although I am tempted at the thought of using it for spices and seasonings. Great ideas! They are so versatile. I would use the cake stand in my kitchen for seasonal decor. I love them for seasonal decor, too! I am going to get my cake stands out right now! I keep on by my sink and change out the platter on top and add holiday sussies during the year. Love all the ideas for the cake stand. I can hear my craft room calling out for something like this, it would be perfect for all kinds of craft supplies. And it goes well with a few other galvanized pieces already there! I admire the way you displayed the cake stands in the basket with other decor. Just lovely! Love the scalloped edging! I would decorate them for each holiday and season. So cute, I like the idea of seasonal decor. i love everything at world market. but that towel is so precious!!! Love how you decorated your tray for fall.I never think to display wine corks until i see someone else do it. I love all the various ways you styled the galvanized cake tier! So cute and so easy! I love cake stands and needless to say I have a few in my collection but I feel, I Always have room for another. Many different ways this can be used for but my first thought was to have different candies in them for display on my dining table or make beautiful display for each of the holidays and birthdays.